My life came to what felt like a grinding halt after my PE in early June 2012. I went from running half marathons, working out, eating right, hanging out with friends and spending time outside to what felt like nothing. I didn’t run for nearly a year, ate whatever was quick and easy (and usually not healthy), withdrew except for a close friends and family and stayed inside as much as possible. Not only that, my thoughts, emotions, reactions and even my personality changed. I became afraid to do everything and didn’t take any more physical risks if it could be avoided. Having withdrawn from people and activities I previously loved, I also became depressed, unsure of myself and fearful. Everything was different from my thoughts, to my body to what I needed to do to take care of myself. I felt like I was serving a life sentence after being diagnosed with antiphospholipid syndrome placed on blood thinners indefinitely. Not only that, didn’t particularly like learning to live on blood thinners so I gave up on life for the past year. I knew I should expect a long recovery, my doctor told me a week after my discharge to expect to be in intense recovery for one or two years at the least, but what I did not expect was the toll it would take on my physically, mentally, emotionally and even spiritually. Running was the one thing I could do to feel good about myself, take care of myself and still feel connected to my mother who passed only two years ago – and I couldn’t even do that anymore. I asked “Why me?” and “What did I do to deserve this?” without any discernible answers. I attempted walking and running several times over the last year, but I always stopped when it hurt or when I was gasping for air. I handled pain differently – as in, not at all – and I used to thrive on pushing my body to and even past limits I thought I never would. After 363 days of recovery, I ran again and felt good about it. I was feeling normal again and physical fitness, including pushing myself past my comfort zone became part of my life. I trained for and ran my second first 5K, which was more difficult than I ever imagined. Still, I did it and while running will never be the same for me (I’m struggling to run since that 5K), my body, mind and soul still longed to be challenged in new and different ways. While I remained cognoscente of the fact that I was on blood thinners, including reporting for my weekly INR checks without fail, I gradually stopped living in the past in terms of my illness and started to take on new challenges again. When my husband, an avid woodsman, invited me to go backpacking last weekend I jumped at the chance without hesitation because I had never been before. The hesitation came after I made the commitment when I briefly pondered what precautions I needed to take since taking blood thinners. I packed my pills, alerted friends and family as to where I would be and donned my compression stockings. I was ready – and it was a big step for me to take on a new physical challenge since my PE. I was scared, yes, but also excited. There is something undeniably liberating about placing your belongings on your back, lacing up your boots and walking into the woods. You have to rely on your own instincts, your own abilities – and not to mention your own strength, of which I am lacking at this time. 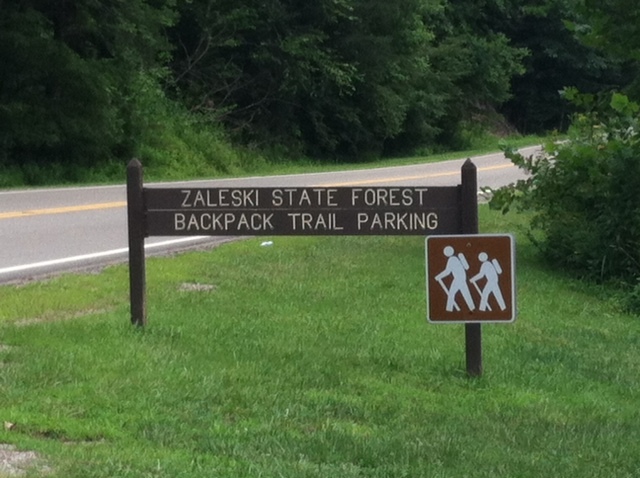 About a quarter mile into the four or more mile hike, I was struggling with the weight of my pack (about 30 pounds) and the rough terrain of the Zaleski State Forest in Southern Ohio. The countryside is riddled with hills and ravines and while not mountainous, the trails harbor steep inclines. In many places, the trails border the cliff face with a path only about a foot wide and are littered with roots, sticks and loose rocks. One wrong step and you could be dangling over the edge of a cliff or sheer rock face. I quickly discovered that I had lost my sense of balance over the past year and had to work had at simply walking and staying on the trail. It was a challenge and sure enough, I fell flat on my back after about a mile on a slab of previously unnoticed wet rock. It hurt. My husband and I checked over myself completely before moving on for signs of bleeding or injury. There were none and my husband asked numerous times if I wanted to turn around after the fall, but I was out to prove a point and we continued on – and on. I was feeling confident. I had fallen on the trail, picked myself up, checked for injury and moved on when there was none – all while on blood thinners. I exhaled a little longer as I mentally told myself I had overcome the worse – injury on the trail and I was okay! Why had I lived my last year afraid to do anything? It was then that the trail took a long detour out of the ordinary way and we came to the cliff. I had been on my feet for several hours at this point and was tired. A detour was not something I had counted on – either had my husband – but I figured it was all a part of backpacking in the wild, unpredictable and quite often unforgiving, great outdoors. My husband asked me if I was comfortable going down the hill. It was steep at about a 60 percent incline and the soil beneath my footing was loose. I nodded I was, too tired to think about it too much, and started down the hill after my husband. My original plan was to shimmy between the few trees that were there, but after slipping almost immediately, I sat down and slid downward. The hill was steep enough that even sitting down, I was moving forward without meaning to. I made it to the first tree and stood up to catch my breath. Braced against the tree, I noticed we were actually on a cliff shelf, as I call it, with one smaller shelf below us and a cliff edge just beyond that. I put it out of my mind and prepared to sit down to slide to the next tree. I was tired, hungry, frustrated and sore. All I wanted to do was make camp before nightfall. I don’t know what happened next. All I know is in one instant I was standing against that tree and the next; I was tumbling head over heels down the shelf, barreling towards the cliff edge. I briefly remember seeing my husband turn around to say something and I remember my ankle twisting behind me in a way I was pretty sure it wasn’t supposed to. I remember feeling 30 extra pounds pushing me faster and I remember trying to determine which way was up. Once I did, somehow, I dug my fingers into the soil and tried to do the same with my feet. Too much pain in my right ankle. I felt my wrists being bent backwards and then, I felt myself start to slow down. Just as abruptly as it started, it stopped. I was on the second cliff shelf and my pole went over the edge. I didn’t see where it landed – but it was out of sight. The woods were deathly quiet. The first sound I heard was my husband making his way to me, asking me if I was okay. I don’t remember if I answered. I remember I was lying on my side/stomach, fingers still in the dirt and my right ankle sprawled awkwardly in front of me. I tasted dirt in my mouth and spit out sticks. It suddenly occurred to me to check my teeth to see if they were all there, and they were. I didn’t move. I couldn’t move. I remember staring at my ankle, not sure of what I would find under my pants. It seemed like several moments passed before I felt it – pain surging from my ankle to my leg and back down. “Can you walk?” my husband said the moment he got to me, a look of panic flashed over his face, and I know he tried to hide it. I didn’t answer. I didn’t know. And we were a long way from any form of assistance. Are you bleeding? I thought to myself as my husband started touching me all over, lifting my clothes and looking under my hat. He asked me to move my ankle and I did with a slight grimace. “I don’t see any blood,” he said. He helped me up and I gingerly put my right foot down. It held my weight, even though it hurt and I knew it wasn’t broken. “We have to get you down,” he said, which was when I realized I didn’t even fall all the way down the hill. You have got to me kidding me. I nodded my head took a deep breath and prepared to slide down the rest of the way when the extreme terror overtook my body. I stared shaking from head to toe and I felt tears welling up in my eyes. I was done. I looked around me wildly – I couldn’t go up, I couldn’t go down and no one could do anything to help me, but me! Somehow, I made it to the bottom of the hill without further incident and eventually, we made it to camp, although my ankle slowed us down even more. 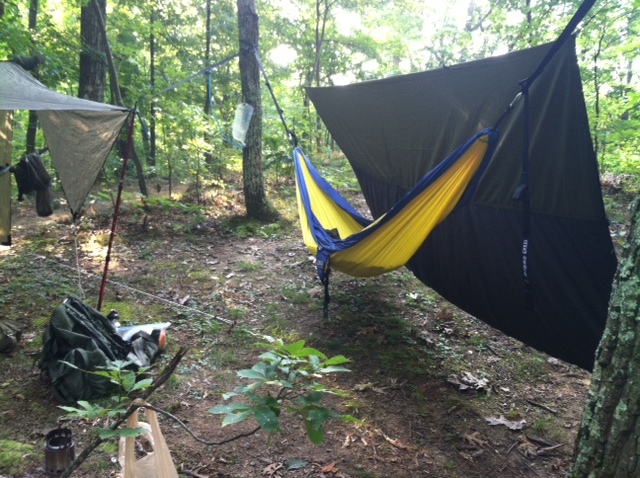 We set up camp just before nightfall and after eating, I immediately laid in my hammock where I could elevate my ankle. I fell asleep almost instantly, but awoke in the middle of the night with vivid dreams of extreme swelling, recurrent clots and helicopter extractions from the middle of nowhere. My ankle was throbbing which made it even harder to fall back asleep and I tried to have faith in my compression socks. I fell back into a restless sleep and awoke with the sun. Completely dedicated to hiking back out. I did walk back out, but we took the access roads to avoid further incident on the trails. What should have taken a couple of hours actually took half a day. I’ve struggled with what to write about all of this – besides I am extremely lucky to have very minor injuries and the ability to walk anywhere, let alone out of the woods. My purpose in writing this is two-fold, I think. First, don’t let blood thinners stop you from living the life you want to live. It’s scary, it’s rough and you might get hurt – but you might also get to do something you never thought you could before and make a beautiful memory along the way. And second, if you are recovering from a blood clot be careful while learning to live on blood thinners. While I have a wonderful (and all too exciting) memory from this weekend, I also need to keep in mind that I do have extenuating circumstances that other people, may not and that puts me in a different situation. I do need to be careful, pay attention and take care of myself above all else. In hindsight, going down the hill was not the smartest decision I made that day. Don’t get me wrong, I’m glad I did, but next time – especially if there is a cliff involved – I need to take some extra precautions. Learning to live on blood thinners is about balance and we all need to find the balance that works for us. I would say to you – don’t be afraid to live your life, have new adventures, try something different and make the most of the precious gift we have been given; but also respect what your body, mind, heart and soul have been through. Sometimes, that might mean slowing it down a little bit or taking a different path than the one you want to take –literally or figuratively! Be kind to yourself, respect what happened to you and your recovery, but don’t let it rule your life. Share your story. 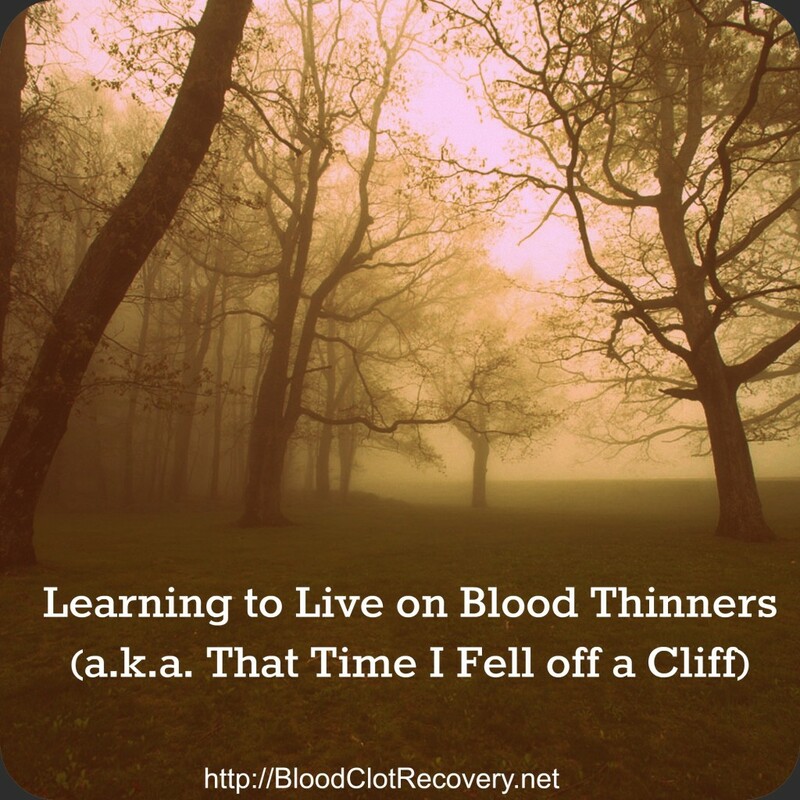 How are you learning to live on blood thinners? Have you been afraid to do something because of your diagnosis or did you do something you never thought you would in spite of it? Have you been seriously injured since your clot(s) and what did you do? Have you ever fallen off a cliff? Would taking blood thinners stop you from doing what you want to do? Why or why not? I’m 20, and it was discovered that I had a dvt blood clot, quite large in my left leg just over 2 weeks ago…. So I know I’ve only been on blood thinners for 2 weeks, but I’m so scared…. I bruise and bleed so easily, and I know it’ll take a little whole for my INR to become stable…. Though, this blood clot, to me, just seemed to come out if nowhere…. It’s like my one and only joy and release, running, has been taken away from me…. I am sorry to hear this has happened to you. I am also a runner and completely understand how you are feeling. 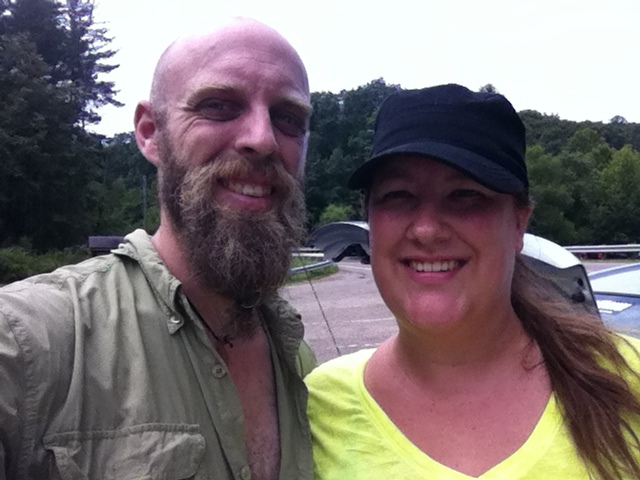 Check out my running blog (under About — Sara’s Story) and maybe you can find some inspiration there. It took me just about a year to be able to run again and that year was on of the hardest of my life. I understand. Don’t be a stranger – you are most definitely NOT alone in this! I was a mere 24 years of age serving my country with the military. October 1994 – the year that changed my life forever. After that came both November and December 1995 – 2 more drastic changes; then came January 1996 – A filter implant in my stomach. I was diagnosed with Deep Vein Thrombosis; the year 1994 and 1995 – 3 pulmonary embolisms that should have taken my life from me but they didn’t. 1996 – the doctor at the time wondered why I needed the filter. I sarcastically told him that I am not supposed to be breathing right now but I am. Hence, he looked at my chart then wheeled me into surgery for the Greenfield Inferrior Vena Cava Filter implant. The technicians in the surgery room were keeping tabs on me while the surgery was taking place. They asked me what I was thinking about as the surgery took place. I told them: praying for a full recovery, thinking about my family and friends that care and love me unconditionally and they are praying that this surgery goes well. It did as planned. I was fortunate enough that my parents came from Florida to Mississippi to visit me while I recouped in the hospital. They were my blessing in disguise. Fast forward to April 2004, I married the man that God blessed me with. Just this year, April 2014, we renewed our vows for being married 10 years. Both the first time we got married then when we renewed our vows are so far the best things to happen in my life since being diagnosed with DVT and having survived 3 PEs in one year. As I look back on my experience with living with blood thinners, having to wear the compression stocking on my right leg, I live my life to the fullest. I have battled with the thoughts of negative feelings of “the why me” and why am I still here living on the earth instead of in it. I am reminded that I was kept here for a reason. I have a husband who loves me unconditionally, countless family and friends who want me to my life to the fullest extent. My husband told me once that I am the only woman that he’s ever going to fall in love with within his lifetime, wants to spend the rest of his life with me. For this thought, I have forever grateful that I am alive and well today. Hello Karen! Thank you so much for sharing more of your story with BCRN. Your words are very beautiful, and I am grateful to be able to read them and know you are truly loved and cared for by your husband and your family. I know how important it is to have family and friends that love and support you during a recovery such as this. Not everyone has that, but I am grateful you do. You are a never-ending source of strength and positivity for me, and I hope my marriage can be what yours is someday. Thank you for sharing! Many more to you and your husband. So grateful you are here. I’ve had heart issue since birth but was started on blood thinners and given a pacer/icd and a st judes aortic valve all the year I turned 21. I’ve been hurt, had fun, drank in moderation, had bruising on 65% of my body once when an ex boyfriend beat me up. I’m now almost 31 super happily in love, now full disabled after a car accident broke my neck and they can’t fix it due to my other issues. Life changes, just be careful,thankful, and happy there is ANOTHER day. Take risks, this article is right, we need to live, safely, but still a full and whole life. Hi. I am curious to know about the other issues you mentioned on why you can not have your neck fixed. I have to get a valve replaced and want to know what i am up against.